Canvey Island slipped to their fourth consecutive home defeat on Saturday, losing 2-1 to league leaders Bowers & Pitsea at The Frost Hire Stadium. Manager Mark Bentley made two changes from the side that were beaten 1-0 by Witham Town a week earlier. In came central midfielder Jose Figura and winger Jack Simmons, with Adam Topley and Lanre Balogun the players to make way. There were two former-Gulls in the Bowers starting XI; central defender Richard Halle and forward David Knight. Canvey had their first shot on goal inside 60 seconds when the ball was worked to the edge of the box to Martin Tuohy. The forward hit a left-footed shot towards the bottom corner which goalkeeper Andrew Wilton saved diving to his left. Bowers took the lead with their first attack of the match in the seventh minute. Quentin Monville raced away from Sam Collins down the right wing, sending over a great cross which David Knight finished with a glancing header across goal and into the bottom corner. Soon afterwards winger James Thomas pulled the trigger from 25 yards, forcing a good save from Harry Palmer who flung himself high to his left to turn the ball behind for a corner. On 20 minutes Martin Tuohy played a pass into the path of Kane Gilbert who took the ball in his stride and continued his positive run into the area. The youngster’s shot however caught a deflection and looped up into the grateful arms of the goalkeeper. Up the other end four minutes later, Quentin Monville hit a curling shot from the edge of the box which looked destined for the top corner before striking the head of Elliott Warren and going behind for a corner. Canvey drew level on 33 minutes when a free kick from the right was played into the area and saw Martin Tuohy shoved over. The referee was well placed and didn’t hesitate in pointing to the spot. Tuohy picked himself and sent the keeper the wrong way from the spot to score his fifth goal of the season. The Gulls then nearly took the lead six minutes later when Sam Collins ran up to strike one of his trademark long-range free kicks. Despite being 35 yards from goal, Collins had Andrew Wilton scrambling across his goal before the ball whistled past his left hand post. The visitors got their noses back in front three minutes before the interval with the influential Quentin Monville involved was again. The time the winger beat James White for pace and clipped over a cross from the right to the back post where Brad Warner was on hand to head home unopposed. It was nearly 3-1 four minutes into the second half when Brad Warner’s shot from the edge of the area caught and deflection. Harry Palmer did brilliantly diving low to his left, getting his hand to the ball and managing the divert it over the crossbar. Palmer made another superb save 65 minutes when a free kick from the left was met with a downwards header at the back post. The ball bounced and was heading for the top corner before the keeper flung himself skywards to force a corner. Canvey had a great chance on 71 minutes on the counter attack. Substitute Josh Hutchinson raced away from the Bowers defence down the right and got to the edge of the area. However, he dragged his shot across goal wide of the target with only the keeper to beat. Both sides had further chances in the final 20 minutes, with Quentin Monville having a shot from 25 yards go narrowly wide for Bowers before Frankie Merrifield saw a snap shot from the edge of the box saved by Andrew Wilton. 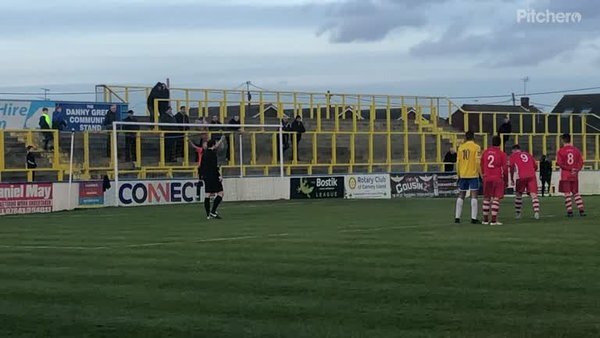 However, neither keeper was fully tested in the remainder of the match and the visitors held on to complete a league double against the Gulls.